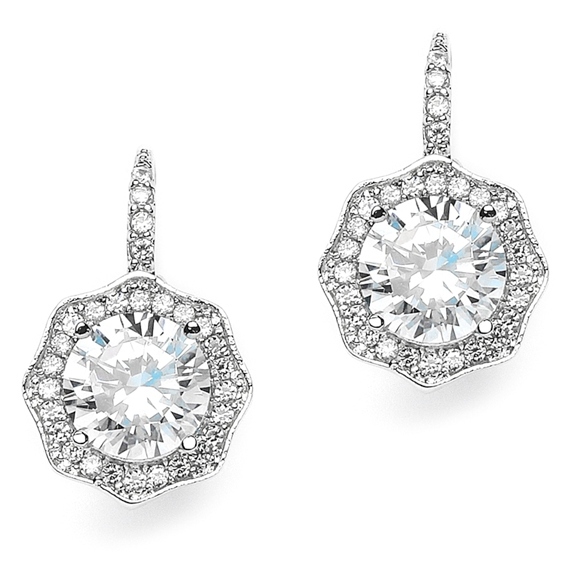 * Mariell's 7/8" h x 1/2" w drop earrings have 3 Ct. Cubic Zirconia framed in micro pave to look like real diamonds! * Brides, mothers of the bride or party goers will adore these CZ wedding earrings that have the look of priceless vintage jewelry! * These vintage drop earrings features a brilliant 3 Carat Cubic Zirconia surrounded by a glittering hexagonal pave design. * Our Art Deco style AAA quality CZ earrings have pierced lever backs and are perfect for brides, bridesmaids or mothers of the bride. * Add these glistening wedding earrings to your bridal store's showcase for the look of fine jewelry at a great wholesale price!